lDivorce: The child's mother has "left"
We had avoided Firehouse Dog in the theatres because of all the reviews we had read that talked about the sophomoric jokes about the dog eating a pot of chili and the ensuing flatulence. Clearly, whoever wrote those reviews had not actually watched the movie – at least not very closely – because in the first place it wasn’t chili, and in the second place, yes, there are some gas-passing bits in Firehouse Dog, but they are fairly minor and fast, and are definitely not major enough to warrant avoiding this movie. 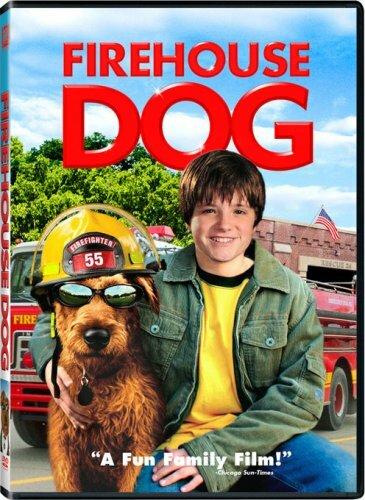 Firehouse Dog was definitely a surprise, because I had my finger on “pause” for the first several scenes, until I realized that this movie was not only nowhere near as bad as I’d thought, but actually was an ok movie, and it has a pretty sweet storyline. The premise is that the main character, Shane, a pre-adolescent boy, is headed down the trouble lane, cutting school, and being ignored by his fire chief single-father. Not only has his mother disappeared (and that’s all that we hear about that, it is very subtle in that regard), but (and this sets the tone of the entire movie), the previous fire chief was his uncle (his father’s brother), who lost his life in the line of duty. His father believes that it is arson and related to a series of fires that have happened since, and the audience sees devices made with watches and cigarette packs that clue the audience in to the fact that is father is right. Through mechanisms that I won’t reveal, Shane ends up with a ‘stray’ dog, and learns responsibilty, while his father comes to realize that he has basically ignored his son and his son’s needs since his brother passed away. In the end it’s a sweet story line, although there are some intense moments (especially at the end, when Shane gets trapped in a fire set by the arsonist (whom he of course has identified, and in the end helps to apprehend)), but of course in the end everyone is safe, and they live happily ever after. I personally wouldn’t recommend this, however for children below the age of 10, or 9 at the youngest.